A much better day today in Graz. We had only 2 therapy sessions and play picnic. Therapy with Elisabeth the speech therapist went well. It didn’t start off well with Jason knowing what was coming he was screaming before anything started. Elisabeth has such a wonderful way with Jason, the two of them just click and they understand each other. In no time Jason was happy again and Elisabeth was able to continue her therapy with him. She managed to get 2 syringes of carrot juice in his mouth and he swallowed so that was wonderful progress today. He is gaining more confidence with allowing Elisabeth near his mouth and face area too. Ingrid the occupational therapist was next, straight after ST, so that was a tough one trying to convince Jason that they would have fun together and do fun things. Also didn’t start off well at all with lots of crying and screaming and he was very angry. He eventually realised that Ingrid wasn’t there to hurt him and make him do things he didn’t want to do and he eventually calmed down and managed to have a good therapy session. Ingrid had another therapist working with her today. They did things like putting “play money coins” in a money box tin, working with his hand co-ordination of putting the money in. They also did the lentil bath, Jason’s favourite. Today he was in there without his socks and really touching and feeling the lentils. They practised showing him how to scoop the lentils with a cup and put them into a tin. At first he found it quite awkward trying to get his hand co-ordination right but once he got it right there was no stopping him. Jason’s weight today was 10.95, a bit down from yesterday. Play picnic went well. He had not had any early morning milk via the tube so he was ready to get into that room and was trying to eat the tuc biscuit packet before we even got into the room. Bruce and myself went into the room together with him and then when he was happy to sit there without a problem, I left to observe in the observing room next door. The group is too big to have two parents at once. The whole tuc biscuit packet was totally destroyed. A lot went into his mouth, he was shoving them in his mouth until there was no more room then he sat there and destroyed the rest of the biscuits by crumbling them and breaking them up. Then rubbing them in his hair. Ingrid came into the viewing room to see how Jason was doing and she was very pleased. She said that what he is doing by crushing with his fingers is fantastic. He is getting the feel of the food with his hands and fingers and he needs to do this more often. Once he is comfortable with touching and playing with the food he will eventually get the feel or use to swallowing. She said the hands and fingers will work the same as the mouth area, it will take a while for him to get use to it and eventually he will swallow without even thinking about it. After play picnic everyone had turns chatting to Professor Dunitz. She is very pleased with Jason’s progress, happy to see him walk into the room with a mouth full of biscuits. She said swallowing will come and we mustn’t make a big issue of the food in his mouth by telling him to swallow. We must try and ignore him and act like its ok and distract him and eventually he will swallow without even thinking about it. She told us to buy a whole lot of packets of tuc biscuits for the weekend. We must only give him 500mls at night via the tube when he is sleeping and it’s very important that he doesn’t realise that he is being fed via the tube so all tubes must be taken away while he is sleeping. She spoke about the fact that Jason is different from other children. He doesn’t have full on autism but he does have "characteristics" or a "degree" of autism. 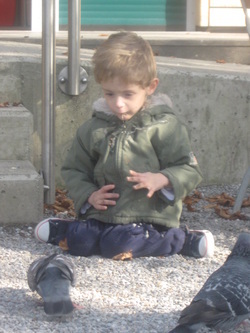 Jason is not like other children, he tends to go into his "own little world" at times. For those of you that know him will agree and Bruce and I have always known this. He doesn't have the anti-social behaviour and no eye contact problem but he does certain things like playing with buttons for e.g. He was playing with the light switch on and off, on and off. She said that we must get him assessed when we get him home and continue and try and find the right therapists to work with the areas that Jason will need working with. We went into town in the afternoon and decided to try and find the cable cars that we have been wanting to do the whole time we have been here. We eventually found the cable car, which was on the same mountain that we went up a few days earlier, just a little further on. The weather was stunning, nice and sunny and Bruce, myself and Jason sat at the restaurant overlooking the whole of Graz. A really nice relaxing afternoon where we sat and relaxed and Jason and I fed the pigeons. 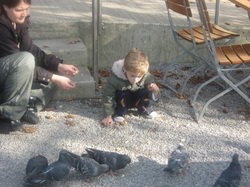 Well I fed them bread and Jason kept feeding them stones!! He was so interested and couldn’t believe these birds were so close to him. Eventually after about 3 hours the rest of his biscuits made their way out of his mouth, thank goodness. He jacket was FULL of spit and food. We just wish he would just swallow. He is happy to put food in his mouth, all thins salty, chips, biscuits etc. but he will not swallow. 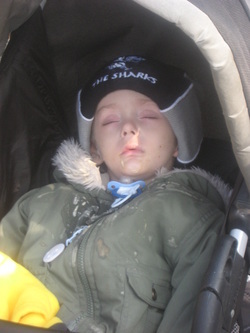 Jason eventually fell asleep in his pram and I gave him some paediasure while he was sleep. We are pretty worried about his energy and hydration levels and also with him being sick we worry more. This journey hasn’t been easy on the three of us, it has been really difficult. Jason has been through so much for such a little boy. Being prodded and poked and made to do the things that he doesn’t really want to do has been hard for him and hard for us to watch and make him do. The infections didn’t help at all by extending the stay and making his eating and therapies that much more difficult. Jason has even started having nightmares in his sleep. At least by coming here we have realised that Jason’s eating isn’t a quick fix and there is going to be lots of work involved. We were hoping for results after the 3 weeks here but Jason isn’t like the other children, he is the only child in both the groups we have been in that didn’t eat or drink a thing so obviously he has a long way to go and the other issues would also cause a delay and will need working on. We didn’t realise that there was so much work to be done. We knew Jason was “different” and “behind or his age” but considering that he has not eaten food in 2 years, was born 9 weeks premature and the fact that he is in hospital every 2 to 3 months with being ill doesn’t help. So when we get home and have settled down and back into our daily lives and routine we need to find the right therapists that can work with Jason and get progress. I don’t think that is going to be an easy task though. Hopefully we will be lucky and find our therapists easily and hopefully they aren’t too far from Ballito. Also there is comfort in knowing that we have a trust fund that can help pay for the assessment and therapies that he needs. We are just so blessed that so many people have come forth to help us and made this trip possible and that there will be money left to finance Jason’s needs and we don’t have to stress about how we are going to pay for his therapy.